A young sprout from one of nature's power carbon keepers—the California coastal redwood— is on display at the University of Michigan Matthaei Botanical Gardens in Ann Arbor, Mich. 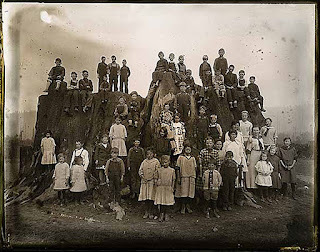 The sapling is from the roots of the celebrated Fieldbrook stump, one of California’s largest redwoods felled nearly 125 years ago. Among the planet’s oldest living organisms, coastal redwoods (Sequoia sempervirens) inspire awe with their immense size and longevity. The Fieldbrook sapling in one of the greenhouses at Matthaei. Matthaei-Nichols is fortunate to have an example of this North American icon—although on a smaller scale. It came to us as a sapling grown from the tissue of a root of one of the largest coastal redwoods ever recorded. The young tree, which measures about three feet high, is on display beginning October 12 at Matthaei Botanical Gardens. The sapling is genetically identical to a tree cut down in Humboldt County, California in the late 1800s. 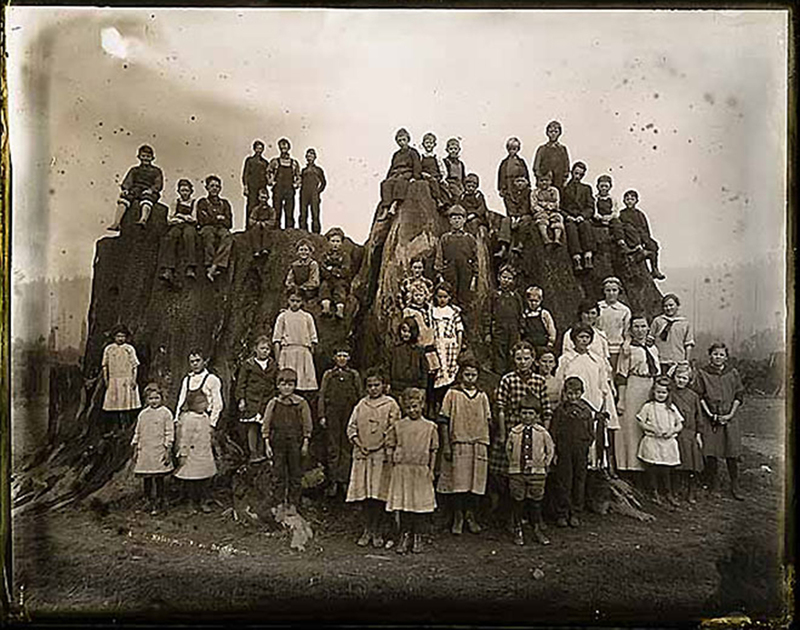 The original tree measured over 30 feet in diameter (not including the bark) and its stump could easily accommodate dozens of people, as shown in the undated picture at left taken by A.W. Hendrickson (photo © Humboldt State University). Many trees---redwoods among them---send up sprouts or suckers after the parent tree has been felled or damaged, allowing the tree to regenerate. One family of trees native to Michigan, the ashes, exhibits this trait. · Their bark can be as much as 12 inches thick. This makes the trees resistant to fire damage. · Coastal redwoods grow taller than giant sequoias, but giant sequoias tend to be larger in girth and weight. · With its combination of longitude, climate, and elevation the north coast of California provides the unique environment required for the coastal redwood to thrive. · Only 4% of the redwoods’ original 2 million acres of historic range are left. Burt Barnes, a professor emeritus at the U-M School of Natural Resources and Environment, gave the tree to Matthaei-Nichols in September 2013. Barnes, who died in 2014, received the tree from David Milarch, founder of the Archangel Ancient Tree Archive. Matthaei-Nichols plans to donate the tree to a botanical garden or organization that can plant it in the best conditions for it to thrive. The sapling will be on display in the conservatory at Matthaei for several weeks. To learn more about the coastal redwood click here for an article from the National Park Service. If you've never traveled to California to visit the coastal redwoods or sequoias, this is an opportunity to see what a young tree looks like and imagine how large it might grow given enough time and the right conditions. For more information about the giant sequoia click here. Source: Sequoia & Kings Canyon National Parks website.